In my recent review for Every Secret Thing, I wrote about the fact that Hollywood ignores too many great novels which could potentially make great movies. But, while these books go unfilmed, the movie industry can't stop making movies based on real-life events. This was once the domain of cable channels, but now every award season is jam-packed with movies based on true stories. So, here's the deal: If they are going to insist on make these movies, they may as well make them good. This deal is broken by True Story. Michael Finkel (Jonah Hill) is a reporter for The New York Times who is doing a story on abused workers in Africa. It looks as if it will be another celebrated piece for the journalist, when it is discovered that he combined the details of several people into one person, thus blurring the reality of the story and creating backlash from aid organization. Jobless and humiliated, Michael returns to his home in Montana, to be with his girlfriend (? ), Jill (Felicity Jones). Michael then receives a call from a reporter in Oregon with an interesting story. A man named Christian Longo (James Franco), who was wanted for murdering his family, was captured in Mexico, where he was telling people that he was Michael Finkel of The New York Times. Intrigued by this, Michael travels to Oregon simply to ask Christian why he would do this. However, after meeting the man, and hearing some of his story, Michael decides that Longo would be a great subject for a book. So, the two begin to meet on a regular basis. However, Michael can't decide if the man can be trusted. With a standard fiction film, the story can run into all kinds of problems, as the writer(s) may not be up to the task of fleshing out a complete story which has a fulfilling beginning, middle, and end. In addition, the script is also responsible for creating compelling well-rounded characters. Movies based on true events don't have these problems. The story has already been told, so the writers only task is to put things in chronological order and really highlight the important parts. The characters are taken from the lives of real people, so they should already be complete and if this story is worth making into a film, they should be compelling as well. Wait a minute, I said that movies based on true events don't have these problems. What I should have said is that they shouldn't have these problems, but True Story is rife with them. Let me cut to the chase, when it comes to True Story, I'm still waiting for the good part. Ostensibly, the film is a drama with elements of suspense thriller. Or at least that's what it wants to be. In reality, it's a film with scene after scene of talking and nothing happens. Have you ever seen a comedy in which you could spot the jokes, but they simply weren't funny? We get a similar effect here, as we can sense the scenes which are supposed to be shocking or filled with tension, and they simply aren't. Co-Writer/Director Rupert Goold makes his feature film debut here, and he is never able to get the story up and moving. His background is in theater, so perhaps he didn't realize that movies is short for moving picture and they need some sort of motivation for the project to work. So, we are left with this: A man who we don't know loses his job, so he moves to a snowy place to live with a woman we don't know. He then goes to meet a man who we don't know who has been accused of murdering his family. The two talk a lot, while the first man decides to write a book about the whole thing. At the end, there is a trial in which no one knows what is happening and then the movie ends. You will wait for some big shock or twist and it never comes. What if the movie was never meant to have one, you might say, to which I'll reply, you can tell that the movie wanted to have a big ending, but it simply fell flat. For the longest time, True Story sits in neutral and then suddenly it becomes a "did he do it?!" movie. 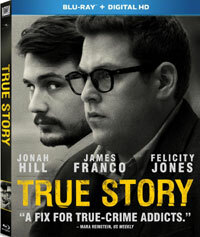 True Story reveals itself to be a biopic in which the real-life people aren't interesting and a thriller with no thrills. James Franco is OK as Longo. I hate to use this phrase again, but you can tell, that the point is that he's supposed to be charming and therefore the jury would question his guilt, but Franco doesn't bring much charm to the role. But, he's light years ahead of Jonah Hill, who simply isn't cut out for this sort of quiet role. (When is Hollywood going to realize that no one like Jonah Hill?) The worst part is that I don't feel as if I learned much about the true story. This is a perfect example of a situation where you would be better reading news stories about this event as opposed to seeing the film. True Story made me wonder how far it is from Montana to Oregon on Blu-ray Disc. The film has been letterboxed at 1.85:1 and the Disc contains an AVC 1080p HD transfer which runs at an average of 36 Mbps. The image is very sharp and clear, showing no overt grain and no defects from the source materials. The colors look fine, just look at the orange jail jumpsuit, and the image is never overly dark or bright. The level of detail is good and some shots show off a nice amount of depth. The Disc carries a DTS-HD Master Audio 5.1 track which runs at 48 kHz and an average of 3.5 Mbps. The track provides clear dialogue and sound effects. The stereo effects are well-placed at times, most notably in the jail. The court room scenes provides noticeable surround sound effects, which offer occasional individual sounds. We get some subwoofer action in the flashback sequences. The True Story Blu-ray Disc contains a small assortment of extras. We begin with an AUDIO COMMENTARY from Director Rupert Goold. The Disc contains five DELETED SCENES which run about 17 minutes and can be viewed with commentary from Goold. This includes several brand-new scenes and a nearly 8-minute "Alternate Ending", which includes a lot of new footage and implies that Longo died. There are four "Promotional Featurettes", "Mike Finkel" (3 minutes), "Who is Christian Longo?" (4 minutes), "The Truth Behind True Story" (4 minutes), and "The Making of True Story" (5 minutes), which contain interviews with the cast and creative team, as well as comments from the real Finkel and archival footage of the real-life case. The extra are rounded out by a "Gallery" and the THEATRICAL TRAILER.